Pink Panther Jewel Heist – MUST PLAY – Raw Thrills, Inc. 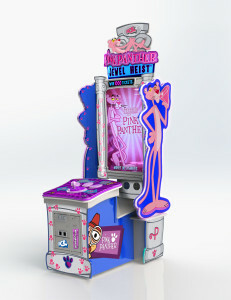 Pink Panther Jewel Heist is the newest ICE and Play Mechanix/Raw Thrills creation to take the stage at arcades everywhere. This simple joystick game requires the player to help Pink Panther scurry down 100 floors to protect his precious jewel. Along the journey, players will have to avoid snarling bulldogs, angry policemen, and a beaming red laser that can catch up to you if you don’t move fast. Can you make it to the first floor without being caught? Read more about the Pink Panther gaming experience HERE. Tagged Dave & Buster's, Jewel Heist, Pink Panther, Pink Panther Jewel Heist, Play Mechanix, Raw Thrills, Redemption Game. Bookmark the permalink.